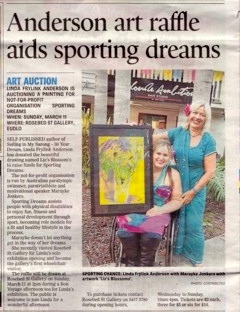 Sporting Dreams athletes have received a boost to their training for the Rio 2016 Paralympic Games after round the world sailor and artist Linda Frylink Anderson donated an original artwork to be raffled for Sporting Dreams. 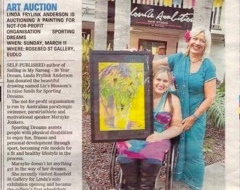 The drawing titled Liz’s blossoms was part of Linda’s first solo exhibition- scribbling barefoot’ held at the Rosebed street Gallery In Eudlo, and raise $250. Marayke was honoured to speak at the exhibition opening and congratulate Linda not only on helping athletes dreams come true, but on achieving her own dream to hold a solo exhibition.